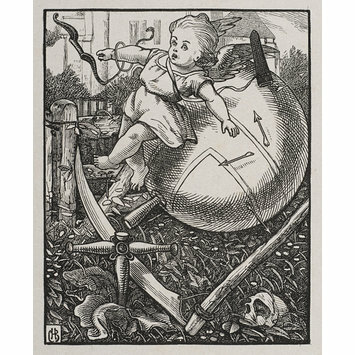 A cherub falling from an orb, the globe of which has broken from its cross, implanted in the ground. This book illustration is in a rectangular portrait format border in the centre of the sheet of laid paper. Proof of book illustration for opposite 'Emblem IX' 38 p. of 'Book The First. The Invocation' for the 1861 edition of 'Quarles' Emblems'. Charles Henry Bennett drew on wood for this engraving to be made by a wood-engraver. 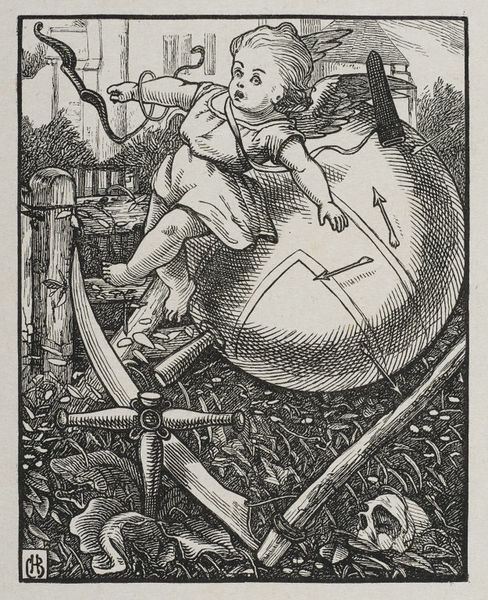 Proof book illustration to 'Quarles' Emblems', 1861, wood-engraving by Charles Henry Bennett.